Former Dropouts Push Others To Reach Finish Line Learning Works charter school in California takes an unorthodox approach to getting young people to graduate. Students who had previously dropped out get mentors who help with everything from getting to class on time to staying up late studying. Now, some of those who graduated are helping others. The National Teachers Initiative is a project of StoryCorps, the American oral history project. Mikala Rahn founded Learning Works, a charter school for students who have dropped out of traditional schools. Carlos Cruz, 24, is a graduate of the program and now works there. 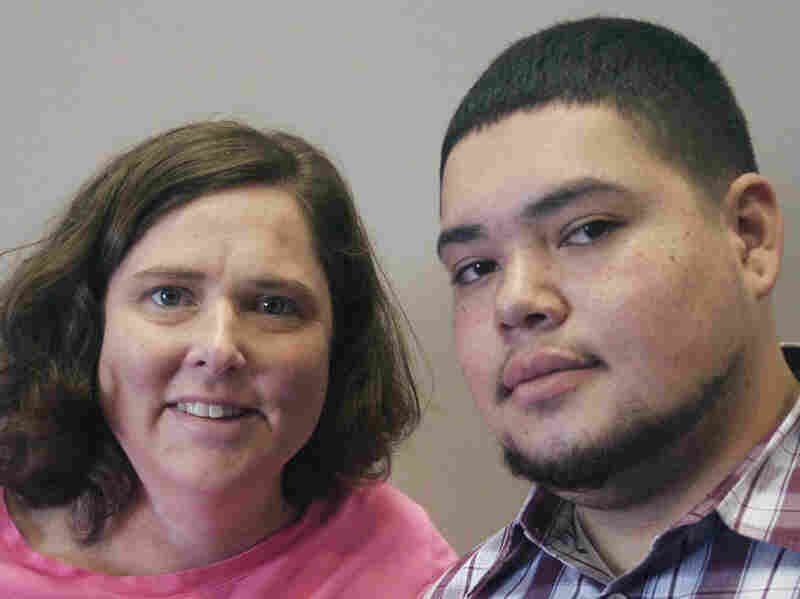 In Pasadena, Calif., one teacher's devotion is helping kids graduate. Mikala Rahn is the founder of Learning Works, a charter school for kids who have dropped out of traditional schools. Carlos Cruz is one of the first students she helped graduate. When he started senior year, Cruz realized he was two years behind. "[I remember] you looking at me and telling me that everything was going to be OK," Cruz tells Rahn, "and me looking back at you, and I'm like, 'How the [expletive] do you think everything is going to be OK?' "
Rahn says it was optimism. "That last year, I worked harder than I have ever, ever even thought of even working," Cruz says. "I have never really even felt in my lifetime that I had learned until those days when I was actually at your house and tutoring." The National Teachers Initiative is a project of StoryCorps, the American oral history project. Each month this school year, Weekend Edition Sunday will celebrate stories of public school teachers across the country. He says they would work sometimes until 2 a.m. Rahn's goal was to get her students a high school diploma. "Until this day, I honestly have my diploma in my trunk. It goes with me everywhere I go," Cruz says. "For me, that was I think the biggest thing I have ever done." Cruz now works at the school Rahn founded. He is one of several employees called "chasers." They basically do what Rahn did for Cruz: make sure the kids get to class, turn in their assignments and study for their tests. The chasers are each responsible for about 35 students. Many chasers were dropouts themselves, and a few have been to prison, like Dominick Correy, who served time for burglary and often works alongside Cruz. "The main goal of everything we do is to eliminate any and every excuse that they can imagine to why they are not attempting to achieve their high school diploma," Cruz says. Chasers, Correy says, serve as mentors, parents and alarm clocks. "Some people say a truant officer." 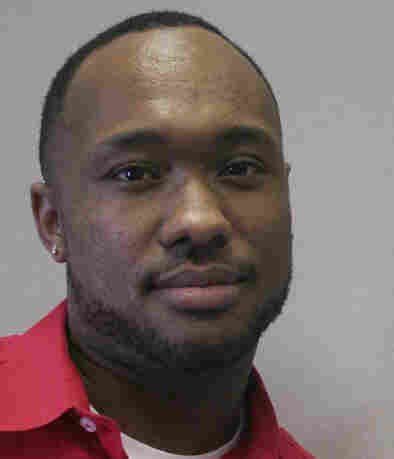 Correy says he never thought he would be able to work at a school after going to jail. "I never thought somebody would even give me a chance to work with human beings," Correy says. "It was like, I lost six years in jail altogether, and I terrorized the streets of Pasadena for so long. So, I think if I save one kid from getting shot, or if I save one kid for going to jail, I feel like my six years meant something." Anthony Gonzales, one of Correy's students, was partially paralyzed when he was injured in a drive-by shooting. "Four years ago, I got shot in the back of the head. And after the bullet hit, I felt like boiling hot water just go down my spinal cord, all the way down to my shoes," he says. "And I remember falling to the ground, my head bouncing off of the ground, and then blacking out for a little bit. And I guess that's when I died 'cause the doctor said I died for like 27 seconds." He remembers the ambulance, the paramedic asking him questions. Then he went into a coma. He was out of school for two years. His first day at Learning Works, he was limping. "I saw everybody staring at me, and I was like, 'I don't think I want to come here no more,' " Gonzales says. But then he met Correy. Correy would pick up Gonzales early in the morning, knocking on the door when he wouldn't answer his phone. 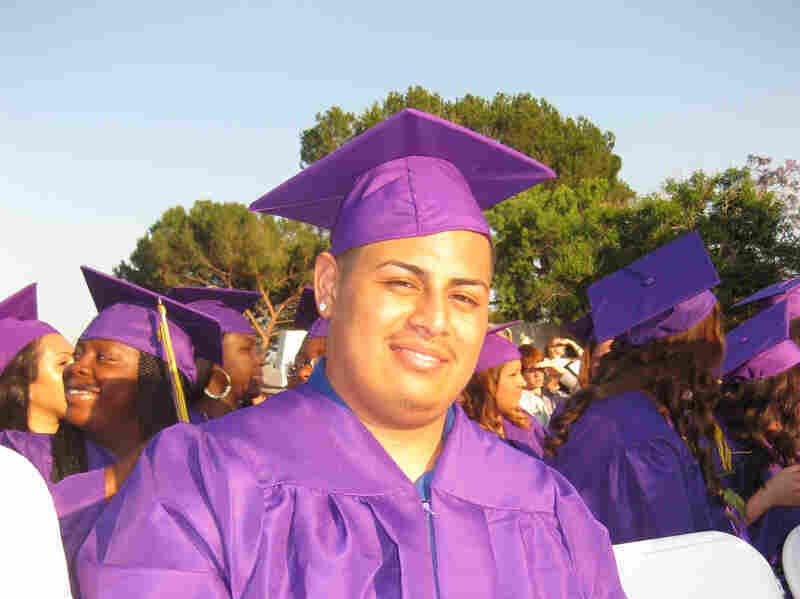 Anthony Gonzales graduated on Tuesday from Learning Works charter school in Pasadena, Calif.
"Can't even brush your teeth, can't even go to the bathroom. It's just, 'Hurry up. We're late already,' " Gonzales says. But Gonzales doesn't hold that against his teacher. "You've always been cool with me, straight up. You were one of us," he tells Correy. "I see you now as a brother." What does he want Correy to do this year to help him graduate? "Don't ease up now. Now is when I need you the most," Gonzales says. Correy says he's up for the challenge. "Because when you walk across that stage, I'm going to be the first one jumping for joy," he says. Audio produced for Weekend Edition by: Jasmyn Belcher, Jud Esty-Kendall, Anita Rao, Brian Reed and Katie Simon.